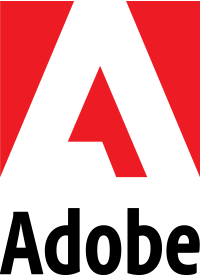 10 reasons why Raleigh is an AWESOME city for designers! #9- Food. And Beer. 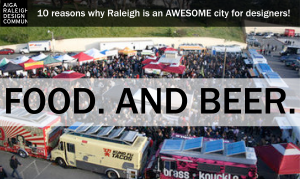 This is a series of 10 blog posts on why Raleigh is an AWESOME city for designers! Food. And Beer. 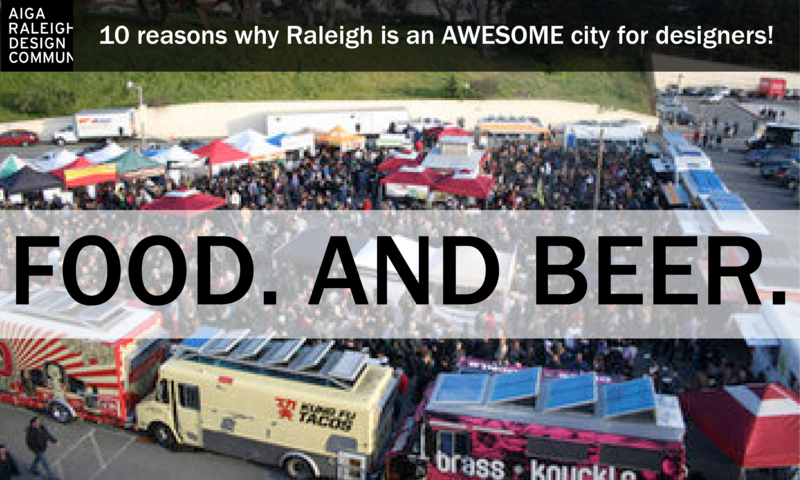 You might have noticed all the accolades Raleigh received on this front. As mentioned before, good food and good beer makes for good designers! There are so many amazing local restaurants in Raleigh and surrounding communities that you could eat out every day of the year and never have a disappointing meal and never have to step foot in a chain restaurant. The craft beer scene has blown up recently, with some amazing breweries opening- many with really great design and branding. The same thing for the food truck scene! There are food truck rodeo events and some really amazing food trucks in the area. Chef Ashley Christensen is quite famous on the Raleigh food scene and designers must take note of her attention to detail and beautiful design! Good design filters down to the decor, the menus, the packaging. Raleigh doesn’t just have good food- it has good design!